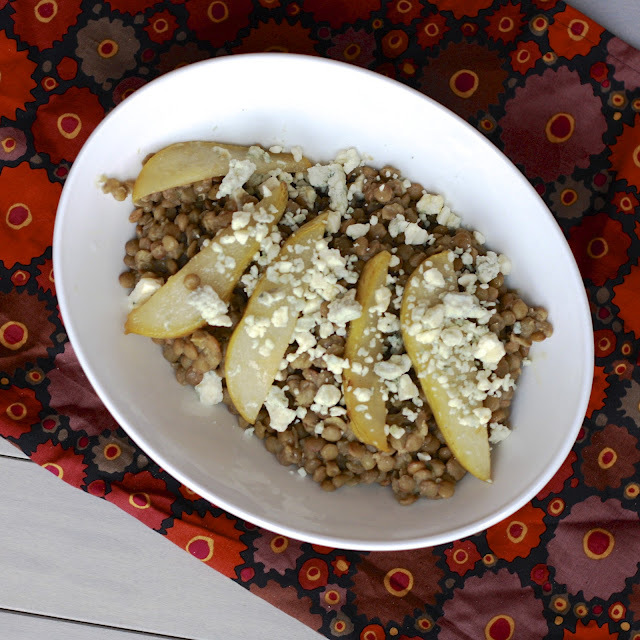 Okay, I know lentils are like the least glamorous food out there and they don't exactly photograph well, but this might have been my favorite way I've ever eaten them. When I saw this recipe in Redbook Magazine in their feature on Fall salads, I was drawn to the pear and gorgonzola additions. Then, reading through the recipe, I was intrigued by the way the lentils were cooked. Instead of just simmering them in water, a twine-wrapped bundle of carrots and herbs was cooked in the pot along with some smashed garlic. After being tossed in a mustard vinaigrette, these were flavorful with an earthy taste from the thyme and parsley and a tang from the mustard. Whoever developed this recipe was brilliant; after taking a bite, I couldn't imagine more perfect additions than sautéed pear and the gorgonzola. Sometimes the oddest sounding combinations are the best! 1. Rinse the lentils with cold water. Tie carrot, thyme, parsley, and bay leaf in a bundle with string and place in a medium saucepan with the lentils and garlic. Add 4 cups of water and bring to a boil. Reduce heat and simmer, partially covered, for 25 minutes or until lentils are tender. Drain and discard bundle and garlic. 2. Whisk together all of the dressing ingredients in a glass measuring cup. 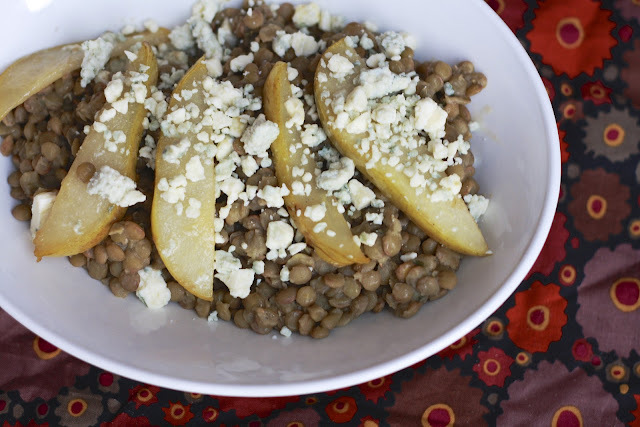 While lentils are hot, toss with dressing in a large bowl. 3. Core the pears and thinly slice. Heat butter in a large skillet over medium-high heat. Add pears and sprinkle with brown sugar. Saute on both sides until golden and slightly caramelized, about 5 minutes. 4. Place lentils on a large platter. Arrange pears on top and sprinkle with Gorgonzola. Serve immediately.